“According to his promise we are waiting for new heavens and a new earth in which righteousness dwells” (2 Peter 3:13). Throughout its history, the church of Jesus Christ has always been plagued by aberrant views of eschatology, the doctrine of last things. In our day, for example, a small but vocal minority insists that Jesus has already returned and that the final resurrection has already happened. Consequently, they argue that Christians should not hope for a renewal of the world but expect it to continue in its present state. 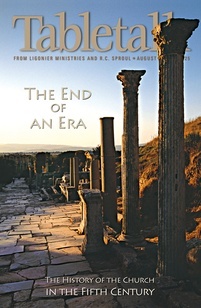 Near the end of the apostle Peter’s life, heretical eschatological views were also being preached in the church. False teachers claimed that Jesus would not be returning to judge the earth and that the world would continue on just as it had from the beginning of creation (2 Peter 3:3–4). This teaching enabled them to preach a moral licentiousness; after all, if there is no coming judgment, then human beings can live however they want to live. As we have seen in chapter 3 of Peter’s second epistle, while the false teachers claimed their teaching was authentic, the biblical view of the last days is far different from what they taught. For Christ is sure to return. Though He may seem to tarry, it is His patience in waiting for His people to come to repentance that has made it necessary for us to wait in holiness for His second advent (vv. 8–12). Jesus will return at the Father’s appointed time, even though it often seems to us that He cannot come back soon enough! His return will be quick and unexpected, and with it the heavens will be burned away. On that day, the earth and all of the works done on it will be exposed (vv. 10, 12). However, even this event will not be the end of the story. As today’s passage tells us, there will be new heavens and a new earth in which righteousness dwells (v. 13). The final state of all things is both physical and spiritual. The dead will be resurrected, and those in Christ will dwell forever with Him in a renewed creation (Dan. 12:2; 2 Peter 3:13). Righteous practice will be natural for us since we will live in glorified bodies free from the struggle with sin (1 Cor. 15:49). Redemption has been accomplished for God’s people, and on that day its application will be consummated in our glorification. The apostle Paul tells us that if our hope is only in this life then we are to be pitied more than all men (1 Cor. 15:19). If indeed there is no coming judgment and renewal of all things, then we have nothing for which to live. But thanks be to God, the new heavens and new earth are coming as a glorious inheritance to all of those who are in Christ. Ask the Lord to help you view your present troubles in light of the new world that is coming.